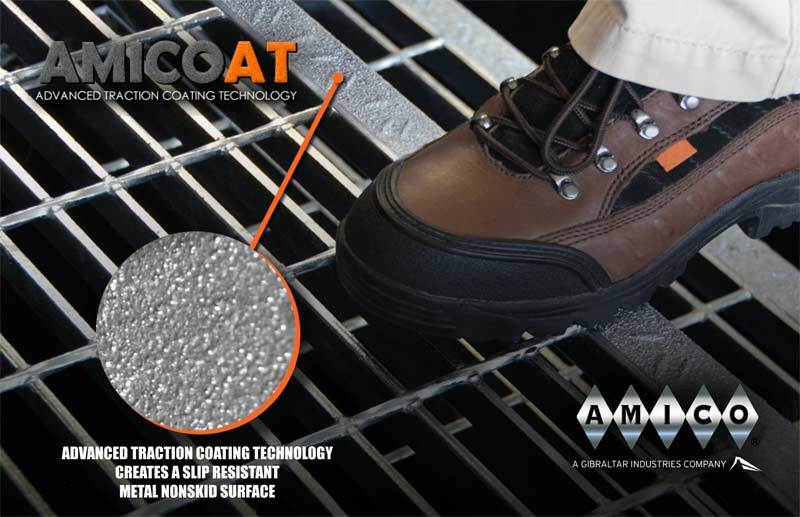 AMICOAT is AMICO’S proprietary slip resistant coating system. This system was developed in response to our customers’ demands for a better slip resistant solution. AMICOAT provides an extremely durable, highly slip re- sistant surface for maximum safety. AMICOAT’s added traction coating technology deposits molten particles of steel that are actually welded to and become part of the surface. This system allows the entire part to be hot dip galvanized as an assembly for superior corrosion re- sistance and long term wear. Unlike other slip resistant coatings which require special preparation before gal- vanizing, AMICOAT can be galvanized under the same ASTM A123 spec as carbon steel grating without special handling as required by the competition. This guaran- tees maximum galvanizing quality, which is crucial to maintaining long-term durability of the surface. Excellent slip resistance, which leads to improved safety (available in smooth or checkered surfaces). Exceeds the slip resistance requirement of OSHA 1910.24(f). Improved galvanizing quality (due to the ability to use standard pickling times with this product). Superior corrosion resistance in all types of environments. Faster delivery times compared to cast aluminum.